During noon time, the City of Pines is a bit warmer but you could still feel the cold air touching your face even if the sun shines at its brightest. The temperature is still ideal for walking with only thin jacket but on dawn time, you need to wear some kind of thick clothing like patagonia jacket to keep yourself warm. The weather is usually 8 degrees cooler than in lowlands. It even drops below 10 degrees Celsius during colder months. 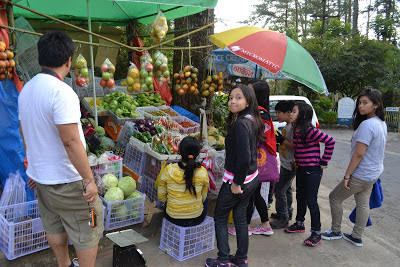 Aside from cold climate, this is what I really love about Baguio, vendors selling fresh fruits and vegetables in most corners of the street. If you are in Manila, convenience stores are usual sight every few meters but here in the City of Pines, souvenir items and fresh produce almost stretch from tourists spots to downtown. I guess you know by now why I would even love to permanently live here.